It’s often hard to get excited about a new $149 graphics card, but NVIDIA’s GeForce GTX 750 Ti becomes one of the rare exceptions. For starters, it doesn’t require a power connector, and it has half the TDP requirement of its nearest competitor – all despite promised performance improvements. What more can be said? Read on! I admit that for the most part, I find GPU overclocking to be unimportant. As an end-user, I just couldn’t justify putting extra stress on an already-complex piece of hardware in order to gain, at best, 10% on the framerate. However, I will say one thing: Where real advantages of GPU overclocking can be seen is at the low-end of the spectrum, such as with the GTX 750 Ti. I’m pleased to report that this holds true with this card. Its default clocks are 1020MHz for the GPU and 1350MHz for the memory, and using EVGA’s Precision tool, I was able to achieve a stable overclock of 1155MHz on the GPU, and 1550MHz on the memory. In what’s sure to be an NVIDIA limitation, which undoubtedly has to do with the fact that the 750 Ti doesn’t require a power connector, every GPU overclocking tool I’ve tried capped the GPU at around 1155MHz. This is despite EVGA offering a 750 Ti model clocked at 1176MHz – clearly, a custom BIOS has been implemented there. The results were kept just about identical for AC IV, but all of the other games saw some rather substantial gains – at least +6 FPS, and more often +7. In the case of Blacklist, the overclock managed an additional 10 FPS, equivalent to a 14% gain. To test graphics cards for both their power consumption and temperature at load, we utilize a couple of different tools. On the hardware side, we use a trusty Kill-a-Watt power monitor which our GPU test machine plugs into directly. 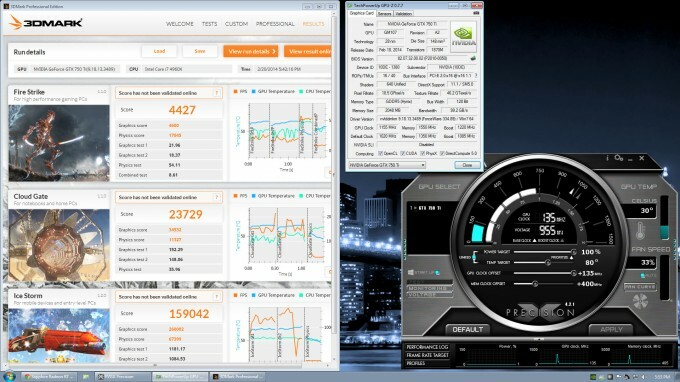 For software, we use Futuremark’s 3DMark to stress-test the card, and AIDA64 to monitor and record the temperatures. To test, the general area around the chassis is checked with a temperature gun, with the average temperature recorded. Once that’s established, the PC is turned on and left to site idle for ten minutes. At this point, AIDA64 is opened along with 3DMark. We then kick-off a full suite run, and pay attention to the Kill-a-Watt when the test reaches its most intensive interval (GT 1) to get the load wattage. Given the lack of a need for a power connector, the power draw results above don’t strike me as too much of a surprise, but the temperature results sure do. AMD’s R7 260X has a substantial-looking cooler, while NVIDIA’s GTX 750 Ti is about as simple as it gets. Despite all that, the 750 Ti didn’t edge past 66°C. This is interesting, because with temps this low, it makes the larger coolers seen on retail cards look a bit foolish. It’s as though no vendor wanted to stick with this simple design based on the fact that it wouldn’t give the allure of the 750 Ti being a powerful card. It doesn’t need to be said, but I’ll say it anyway: Impressive results here. We discovered above that the 750 Ti is much more power-efficient than AMD’s R7 260X (and no doubt the R7 265, as well), and it also runs a lot cooler. But power and temperatures are not all that matters with a GPU, so overall, how does the GTX 750 Ti fare? If the R7 260X were still selling for $149, the GTX 750 Ti would be a no-brainer, given the just-mentioned benefits and the fact that it performs better than AMD’s card in most tests. 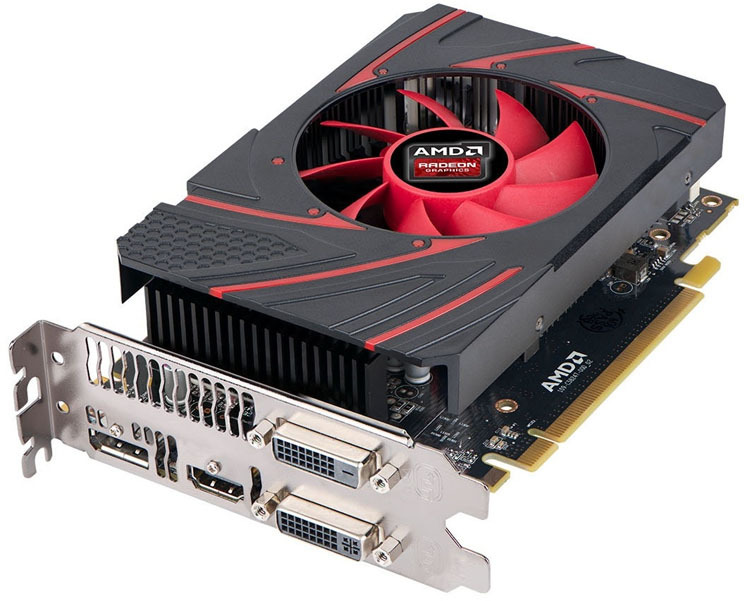 However, with the release of the R7 265, AMD has dropped the price of the R7 260X to $120, a price that can be had right this moment at popular e-tailers. When looking at things from the cost angle, the 750 Ti’s performance does not match its price-premium (25%). For those looking to achieve the best bang for the buck, it’s with AMD’s R7 260X in this match-up. Plus, given the 14% boost in core count the R7 265 sees, it should match the 750 Ti in most gaming tests and perhaps best it in others – and because it’s set to retail at the same $149 price-point, that’s important. However, that assumes that the R7 265 will at some point become available for purchase, something I’ll have to see to believe. So when looking at the facts here, what would cause someone to spend 25% ($30) more for NVIDIA’s GPU, which performs just 0~10% better? Well, for starters, there’s the NVIDIA-specific perks, like ShadowPlay (a technology I wouldn’t want to live without at this point). There’s also things like PhysX, but that’s about as useful on a low-end discrete card as DirectX 11 is on integrated graphics – it’s best left to the big guns. Given the results we’ve seen, I do believe that the 750 Ti could use a bit of a price adjustment, but let’s not gloss over the fact that NVIDIA’s card is far more power-efficient than AMD’s, and will run a lot cooler. Remember, AMD’s R7 260X peaks at 81°C, whereas the 750 Ti with its simplistic cooler was capped at 66°C – a staggering drop of 25°C. There’s also the fact that it manages to be faster overall, but consume 31W less at full load. And while it won’t affect most 750 Ti owners, I’m sure, the fact the card doesn’t require a power connector is major. That allows those with restrictive OEM PCs the ability to upgrade to a card that can deliver 1080p gaming with ease, all without the likely need of a PSU upgrade. While an OEM PC might include a PSU as small as 300W, that’s quite substantial when dealing with such low-power parts. At 60W, that’s a mere 1/5th of a 300W unit, and bear in mind, our test rig, which has 5 high-speed fans, an overclocked six-core Intel processor, and 32GB of RAM, peaked at 242W – nowhere near a 300W cap. And yet, all of the games we tested could be enjoyed at 1080p resolution and with good detail. That, to me, is damned impressive.